Insurance premiums (in red) thus outpaced both general inflation (gray) and worker earnings growth (blue) by a wide margin. That scary spike raises an obvious question: Is health insurance more expensive because of the health reform enacted last year? Stripping out those two specific ACA effects, premiums would still have increased by 7-8% according to Kaiser’s estimates. But that isn’t the end of the story. A remaining question is whether other aspects of the ACA might also have contributed to the premium increase. Kaiser argues, plausibly, that the two factors it considered were the most direct link between the ACA and 2011 premiums. But perhaps there were indirect links as well? DeParle thus believes that the ACA did lead to higher premiums in 2011–beyond what can be explained by direct cost increases–but only because insurers overreacted. In other words, the ACA did cause premium increases beyond what can be explained by costs (since insurers would not have made the mistake about ACA costs otherwise), but the ACA doesn’t deserve the blame for those premium increases. Without any numbers, we don’t know, of course, how much such misestimates might have contributed to the 7-8% rise that isn’t explained by the direct effects of ACA. Any such mistakes will, one hopes, be corrected in setting 2012 premiums. If so, that would soften health insurance inflation in 2012. 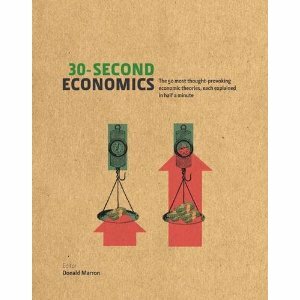 If you’re an insurance company looking to raise rates without taking the political, PR, etc. blame involved in a large raise, the ACA seems to provide the perfect cover. Yup. And one that may have been focal for many insurers, so employer purchasers ended up absorbing it (or passing onto workers) rather than switching to other insurers. Another possible explanation is that 2010 premium increases were UNDER cost increases. 2010 increases were 3%, the lowest in the chart and 2% below increases of the previous three years. If one were to assume that the 2010 rates were set and/or revised in part during the period in early 2010 when the industry was being hammered for overly high rate increases and ended up trailing true cost increases, then the 2011 rates would include 5% (average of previous five years) +2% catchup +1-2% impact of ACA. Good point. In principle, your hypothesis should be distinguishable from the hypothesis that insurers overdid it in 2011. 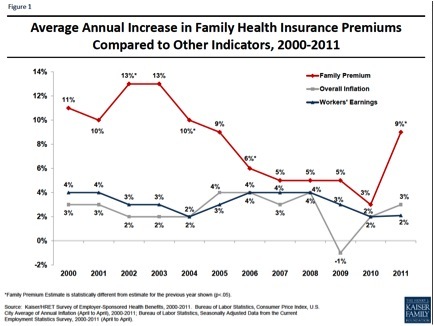 If insurers overdid it, we would expect them to undo it in 2012, leading to below trend premium growth. In your case, though, we would just expect a return to trend. Check in next year. The reduction in usage is a direct result of the new higher deductible plans, right. Folks have more skin in the game and are less likely to buy medical services. the top 14 health insurers exceeded their earnings expectations, with profits that were over 45 percent higher than estimated.